The Friends of the Green Valley Library run two used bookstores--one inside the library seven days a week and one in the Green Valley Village, called the Annex. Over $40,000 is raised annually to assist our many programs. Although some books may run over $5.00, the majority are $1! Donations of used books are always welcome. See map below for bookstore locations. Your donations of used books and magazines provide our inventory. We turn those used books and magazines into the money we use to support library programs and acquisitions. You can drop off your donated books and magazines at the library or the Annex bookstore in the Green Valley Village. You can arrange for pickup by emailing us: Click here to arrange for a pickup. If you are interested in volunteering in the bookstore, you can download an application here: Bookstore Application. Located at the Green Valley Village, Suite 58, between the Green Valley Barber shop on one side and The Greens restaurant on the other. 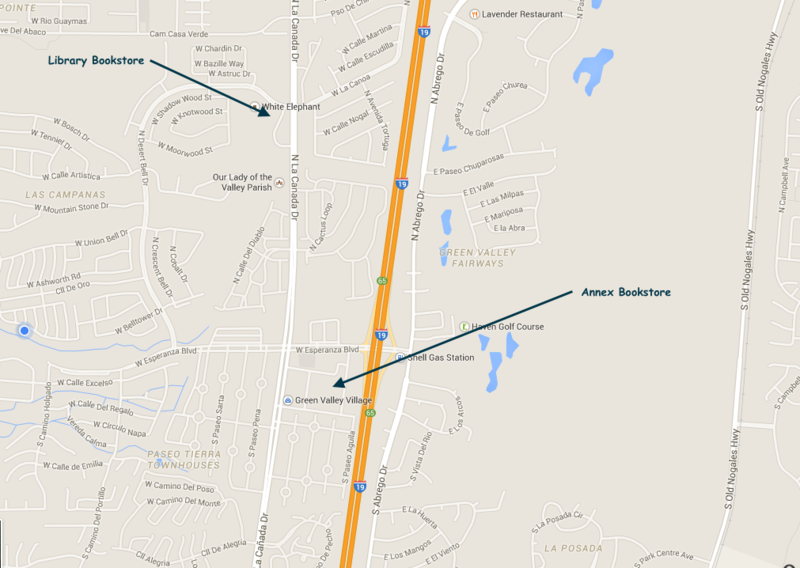 The Annex Bookstore is between the Barbershop and the Greens restaurant in the Green Valley Village Mall.